If you're a RAW Rolling Paper enthusiast, your shredder is your best friend on the road. RAW has created a convenient and stylish way to keep a herb grinder with you at all times. 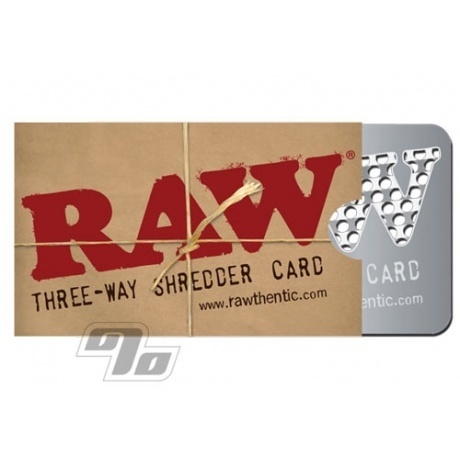 The new RAW Shredder card easily slips into your wallet or pocket. Not only are these handy and convenient but they are also dishwasher safe! Definite must for anyone that rolls their own cigarettes on the go. Credit card sized at 3.25 x 2in in a cool custom RAW sleeve to hold odors in check. 'This card shreds herb pretty well and is way more convenient for on the go use than a big clunky grinder. It takes some getting used to, but it fits in my wallet and travels with me everywhere. It is very handy away from home and gets the job done quickly with a little practice. This couldn't be a full time grinder, but for travel or in a pinch, its perfect. Fits in my wallet just fine. It grinds up the herb very finely and is easy to carry around. Definitely reccomend. I was curious about buying this song got it any way. I was surprised how fine the herb got when shredded and how well it burned with Raw paper. Best investment under 10 dollars.